With the heavy influx of talent that resides throughout the entire NBA landscape, there is one talent that doesn’t get the recognition he deserves. That being Orlando Magic big man Nikola Vucevic. After being selected with the 16th overall pick by the Philadelphia76ers, Vucevic has elevated his game to heights that must begin to draw recognition. 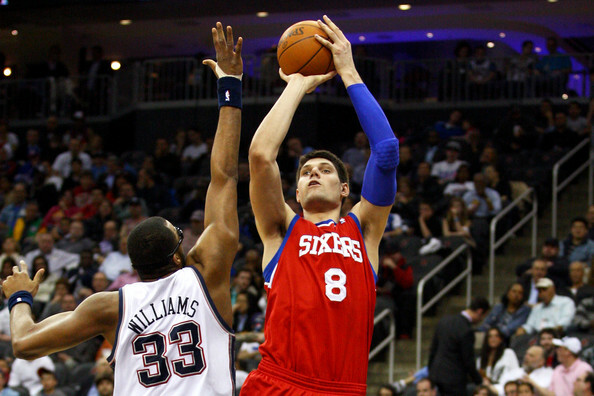 Vucevic would play in only 51 games as a 76ers and would come off the bench in place of Elton Brand and Spencer Hawes. Hawes would suffer an injury that kept him out for 44 of the teams regular season games, which gave Vucevic some time out on the court. In his time out on the court, Vucevic would average just 15.9 minutes per game and would finish with averages of 5.5 PPG, 4.8 RPG, 0.4 APG, and shoot 45.0% from the field. The Magic as a franchise appeared to lye in ruin after their prized superstar Dwight Howard was traded away to the Los Angeles Lakers in part of a blockbuster trade that involved the Denver Nuggets as well as the 76ers. Vucevic was traded to Orlando along with Maurice Harkless and a protected first-round pick. The 76ers would acquire Andrew Bynum in the trade, where he would not play a single minute in his time there. In his first year in Orlando, Vucevic would put together a remarkable first year with the team, leading them in rebounds (11.9 RPG), while also contributing 13.1 PPG. In the same year, Vucevic would achieve 46 double-double and three 20-20 games. The first career 20-20 game came in the form of a career-high 29 rebounds in a loss to the Miami Heat. The Following two years Vucevic would increase his scoring averages by a large margin to 14.2 PPG in the 2013-2014 season all the way up to 19.3 PPG in 2014-2015. In his first three years with the Magic, Vucevic would average a double-double with 15.5 PPG, 11.2 RPG. In this strong fourth season, he would finish second in scoring amongst centers, only behind DeMarcus Cousins. In that same year, he would finish sixth in the NBA with 10.9 RPG and had a career-high 52.3 FG%. The next few seasons for Vucevic, the production began to take a steady decline as he appeared in fewer games each season with his points, rebounds, and field goal percentage. As with any decrease in production, injuries can be a direct correlation. Those injuries Vucevic would battle through would include a sprained knee, a groin strain, and a fractured hand. From the 2015-2016 season all the way through the 2017-2018 season, Vucevic would miss a total of 74 games. To go along with missing court time, Vucevic has been the victim of several coaching changes, four to be exact. None of which have been able to lead the Magic back to the post-season. Fully healthy and in the last year of his contract, Vucevic has been firing on all cylinders this season. In a crowded backcourt in Orlando, Vucevic is averaging career-highs in points (20.7 PPG) rebounds (12.0 RPG), assists (3.8 APG), and blocks (1.2 BPG). An underrated aspect of Vucevic’s game has been his ability to score from beyond the arc. His 37.7% success rate from three is not only a career high for him but the third-highest amongst all NBA centers. In 50 games for the Magic this season, Vucevic has been a double-double machine with 34 double-doubles, and one triple-double. While he has managed to stay healthy throughout the year so far, the eight-year NBA veteran knows that his playing days in Orlando may very well be limited. The Magic will surely miss performances like this though. The Orlando Magic made several personnel decisions regarding the teams front-court. In the 2017 and 2018 NBA Draft, they would have the sixth overall pick in both drafts where they would select big men Jonathan Isaac and Mohamed Bamba. In the 2018 NBA off-season, the Magic decided to renew the contract of Aaron Gordon with a four-year $84 million dollar deal. With the young talent that the Magic have invested in with the past two drafts and the organization making Gordon their highest paid player currently on the roster, the writing may be on the wall for Vucevic. With the February 7th trade deadline soon approaching, Vucevic’s name has been circulated throughout the entire NBA for a team seeking a dynamic interior presence. While his rebounding and scoring ability might be the main attractions of his game, the capability to pass from both the high or low post makes him an offensive Swiss army knife. While he was not necessarily a premier-shot-blocker, he has made more of a concerted effort this year to be taken seriously as a rim-protector. Some of the teams interested in Vucevic’s services include the Boston Celtics and the San Antonio Spurs. The Spurs make sense given their track record of getting the most out of international talent. Boston would most likely need the offensive services of Vucevic in the post-season where at times Al Horford seems to be absent. Regardless of if he is traded at the deadline or not, Vucevic is set to become a free-agent at seasons end. Expect him to test the free-agent waters and wait to see which option is the best fit for him. Vucevic is playing the best basketball of his career and has been rewarded with his first All-Star appearance as he was just voted in as a reserve.